This week’s photo is from early 1947 and is one of the photos for which I did not have any location information and I was not sure whether I would ever find the location. There are no obvious landmarks or features that would help identify where the photo was taken. We are in a park in London and a boy is looking at some form of memorial. I should have realised where it was, but such are the changes looking in this direction across the park, it was not immediately obvious. There is only one part of this photo that remains the same in 2015 and that is the building on the left of the photo. When walking in London, I carry my father’s photos with me on an iPad which makes checking locations so much easier and chance finds I can compare with the original photo I believe I have found. After taking last week’s photos under the southern approach to Tower Bridge, I walked across the bridge and cut through into Trinity Square Gardens at the top of Tower Hill, just past the Underground Station. Behind the war memorial I found the location of the 1947 photo. 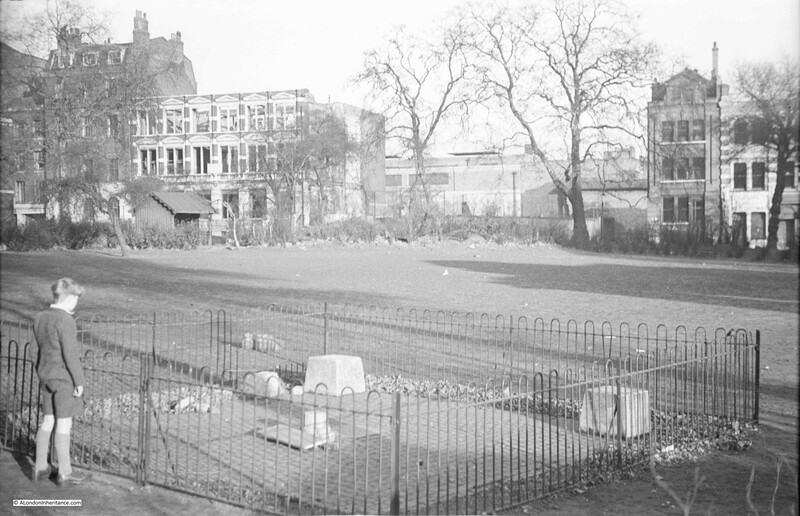 This is Trinity Square Gardens and the boy is looking at the memorial to the executions carried out on here, and the buildings across the gardens are in Coopers Row. This is the same scene in 2015. The layout of the execution memorial has been changed and looks slightly smaller but still appears to be in the same position. 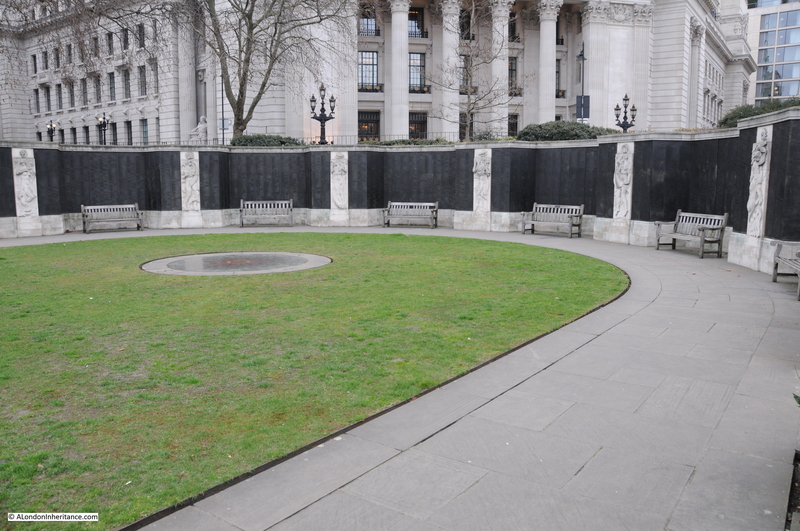 Much of the grass in the 1947 photo is now covered by the World War 2 memorial to merchant seamen. Nearly all the buildings in Coopers Row have changed with the exception of the building on the left, behind the tree. This was the building that confirmed this as the correct location. “To commemorate the tragic history and in many cases the martyrdom of those who for the sake of their faith, country or ideals staked their lives and lost. Around the edge of the memorial are four plaques listing the names of those executed. Whilst the names of some of Henry VIII’s victims such as Sir Thomas More and Thomas Cromwell are recorded, the names of his wives who were executed are not as they were executed more privately inside the Tower of London rather than suffer the public spectacle of an execution on Tower Hill. As well as the Execution Memorial, Trinity Square Gardens is also home to two other memorials. 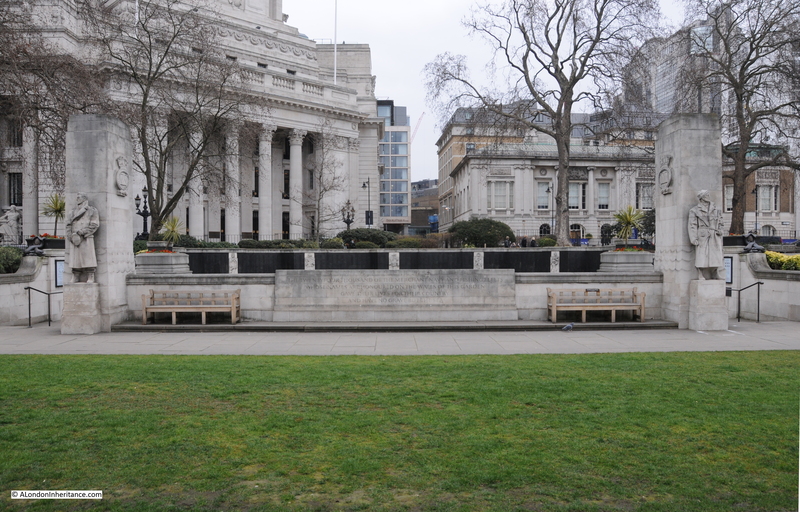 The World War 1 memorial to those lost on the Merchant Navy and Fishing Fleets is not visible in the 1947 or 2015 photos, but is just to the right. This was finished in 1928 and design by Sir Edwin Luytens who was also responsible for the design of the Cenotaph in Whitehall. This memorial consists of a number of vaults with plaques recording the names of those lost at sea. 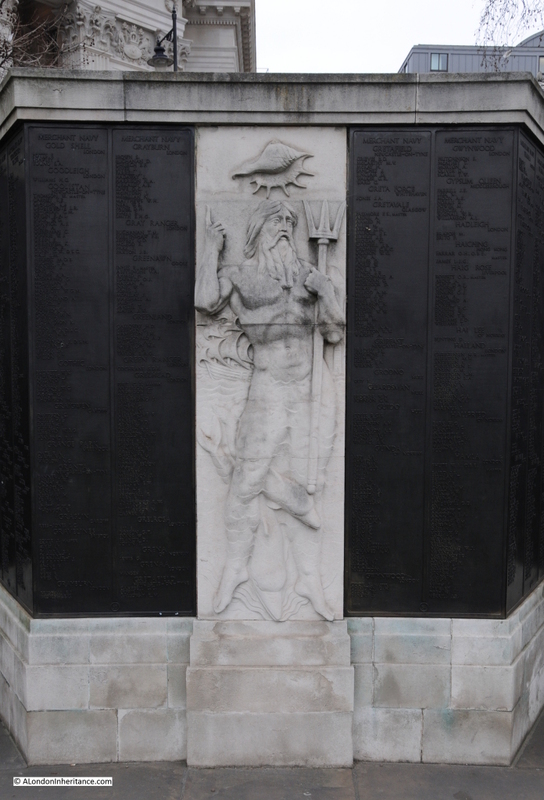 Below the 1st World War memorial is the much larger memorial to those lost in the Merchant Navy and Fishing Fleets during the 2nd World War. This occupies the grassed area in my father’s 1947 photo and can be seen in my 2015 photo. This memorial was opened by the Queen on the 5th November 1955. It was designed by Sir Edward Maufe who was also responsible for Guildford Cathedral and the Runneymede Air Forces memorial. This map extract from 1940 shows the location of Trinity Square Gardens. I find these old Bartholomew maps interesting as they also show the routes of underground lines. The dashed lines routing through Trinity Square just above the red block of the war memorial is the Circle Line. This was built using the cut and cover technique where the tunnel was dug from the surface then covered over. In the above photo, the tunnel is below the grass section between the 1st and 2nd World War memorials. Steps either side provide access to the main area of the memorial. The following photo is looking back towards the 1st World War memorial. The Tower of London can be seen to the left. 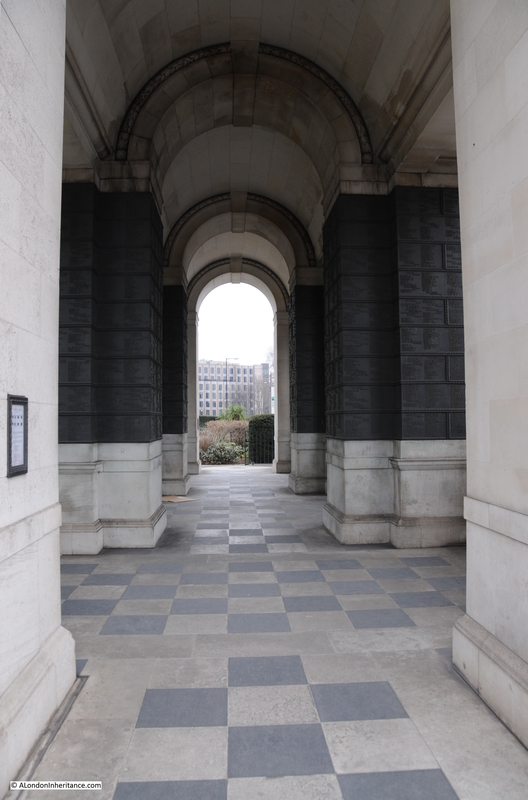 Arranged around the edge of the memorial are a number of alcoves, each with panels listing the names of those lost during the war. It is all too easy to get desensitized to large numbers, but walking around this memorial and reading the names, each an individual with their own unique story, really brings home the sacrifices made by so many. 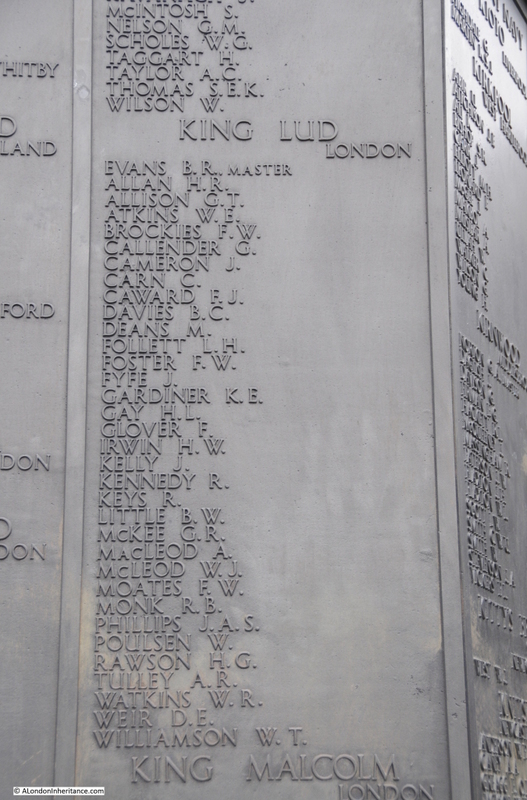 Looking through the names In the 1st World War memorial, which are organised by the name of the ship, I found the King Lud, which seemed an appropriate connection with London. The memorial lists the names of those lost with the ship. Although in the 1st World War memorial, this ship was lost in the 2nd World War. There was a King Lud in the 1st World War, however the crew survived. It was captured by the German cruiser, the Emden on Friday 25th September 1914 off Point de Galle, Sri Lanka. The crew were taken off and the ship sunk. The King Lud that this memorial refers to was sunk on the 8th June 1942 by a Japanese submarine, the I-10. The King Lud was sailing from New York to India when it was attacked in the Mozambique Channel (the area of sea between mainland Africa and Madagascar). The ship was carry military personnel and government supplies. There were no survivors. The Master of the King Lud was Benjamin Roderick Evans who was 52. Among the crew there were also three, 17-year-old cadets and apprentices on board. 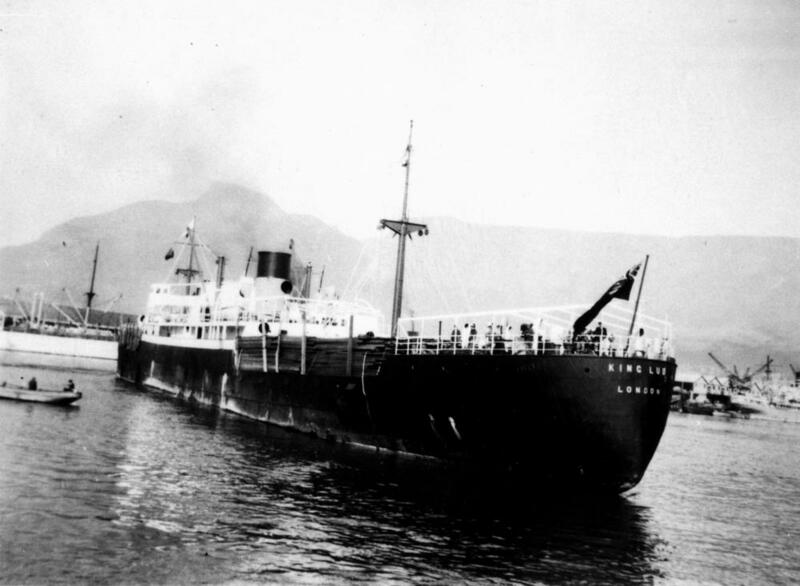 Built in 1928, the ship was owned by King Line, an operator of merchant ships based in London. Off the 20 ships owned by King Line at the start of the war, 14 were lost during the war. Just one ship and crew out of so many recorded across the two memorials. Trinity Square Gardens is an interesting juxtaposition of two memorials. One to those executed on the site over the centuries, the other to those who died in war, far from London. This entry was posted in London Monuments and tagged King Lud, Merchant Marine, Tower Hill, Trinity Square Gardens, War Memorials on March 29, 2015 by admin. Thanks, particularly for the 1947 photo. In the mid 70s I lived in a hostel, run by Toc H, in 43 Trinity Square, but owned by the Wakefield Trust. A motley collection of people, all of whom had some commitment to working with local communities. The hostel, in fact, ran through to The Crescent, eastwards but within the City of London. That part of Coopers Row, visible in the photo, lies within the old Tower Liberties and is part of an intrusion of Tower Hamlets into what, otherwise, is the City. On the Crescent side, we had a basement TV room, the western wall of which was part of the Roman Wall; an unusual feature at the very least! On the roof was a great roof garden tended by one of the oldest residents, a wonderful lady in her 80s. A few years earlier, I had worked in an office in Mariner House, round the corner in Pepys Street. That building has been demolished and replaced with an hotel. The changes to Tower Hill continue. Today I’m a member of St Olave’s Church in Hart Street so my connection with Tower Hill continues. Roy, it is good to have such a long standing connection with Tower Hill, although I suspect many of the changes must be depressing. again, beautifully researched and presented. Thanks so much for all the hard work. I have sometimes looked at Trinity Square and these memorials after I’ve been on a journey from Fenchurch St station, Is the little boy you? Probably not, as you may well not have been born then. Thanks for this. I suspect these memorials are somewhat less well known than they should be, overshadowed as they are by the Tower of London nearby. Maufe also designed the extensions of the Royal Navy memorials in Plymouth, Chatham, and Portsmouth, with sculptures by Wheeler. Obelisks with plaques to commemorate those lost at sea had been erected after the First World War, and enclosures with further plaques were added after the Second World War. There are various other naval memorials from the world wars around the country – another for merchant seamen in Liverpool, one for the Royal Naval Patrol Service in Lowestoft, one for the Fleet Air Arm in Lee-on-Solent, and one for the Royal Naval Division (sailors who fought in the trenches in the First World War) now back in Horseguards Parade after spending about 50 years in Greenwich. Andrew, I agree that the memorials are less well known than they should be. Whilst I was there, there was a constant stream of people walking from the underground station to the Tower of London. Very few people stopped to look at either the War memorials or the Execution memorial. I would have thought the later may have been more visited, given it’s historical connection with the Tower. Thanks for the information about the other memorials. I was aware that Maufe had designed other memorials, but was not sure which ones. 1. 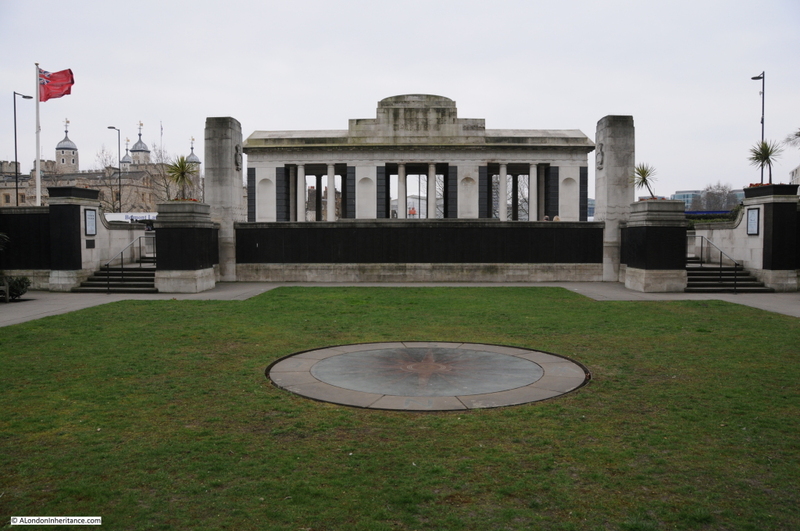 Since it marks what was not the only such site in London, the first-mentioned is the Tower Hill Memorial. It was the place of public execution of, principally, the nobility and gentlemen from the late 14th to the late 18th century, the last being two women and a man hanged in 1780 following the Gordon Riots. Most were beheadings but burning at the stake as well as hanging, with or without drawing and quartering, are included in the total. It is reported that up to 100,000 spectators would attend. Royalty was executed within the Tower of London. 2. As for the war memorials, these form the national Merchant Navy Memorial. In the care of the Commonwealth War Graves Commission, this records, together with those of their ships, the names of nearly 12,000 merchant seafarers, men and women, civilians all, killed in the First World War; 24,000 in the Second World War and 17 in the Falklands Campaign, all of whom have no known grave but the sea. The Red Ensign, the flag of the Merchant Navy, flies permanently over the Memorial. What is now the First World War section was unveiled by HM Queen Mary in 1928 – the event was broadcast live on the wireless and was Queen Mary’s first broadcast – and that for the Second War in 1955 by HM The Queen. The former memorial is Grade I listed, the latter Grade II*. 3. Two annual services of commemoration take place at the Merchant Navy Memorial: all are welcome to attend. The first is the Merchant Navy Day Service which is held on the first Sunday after 3rd September, Merchant Navy Day, or on 3rd itself if a Sunday; in 2016, the service is on Sunday, 4th September. The second is the Remembrance Day Service, taking place on Sunday, 13th November 2016. 4. As mentioned on the site, the Memorial’s panels hint at so much more. The ages of those recorded on the Merchant Navy Memorial range from 13 to 74, for example, while two of those named on the First War section were killed in actions for which they were awarded the Victoria Cross, the highest military decoration, in spite of being civilians. They are Captain Frederick Parslow of the SS Anglo Californian – recorded on the exterior wall at the western end of the memorial – and Captain Archibald Smith of the SS Otaki, recorded high on an interior wall on the southern side of the memorial. They remain the only recipients of the VC within the merchant service. 5. Most fundamentally, by April 1917, one in four merchant ships leaving this country was being lost to enemy action, forcing HM Government’s realisation that Britain would have to capitulate within six months. This finally compelled the Admiralty and ship owners to accept the introduction of the merchant convoy system in May 1917, bringing about a different outcome to the War. Essentially the same convoy system then kept Britain fed, fuelled and fighting in the Second World War. Hence there can be few more decisive contributions to victory in either War than that made by the merchant service. 6. The Red Ensign has been displayed on the Cenotaph since its unveiling in 1919 and it was the Mercantile Marine’s service and sacrifice in the War that led to HM King George V changing its title to the Merchant Navy in 1928. Instituting as well the appointment of Master of the Merchant Navy and Fishing Fleets, it is held now by HM The Queen. .
5. Trinity Square Gardens was laid out in 1797 to front Trinity House, built in 1794-’96, both the work of Samuel Wyatt for the Corporation of Trinity House. Founded in 1501, this is the General Lighthouse Authority for England, Wales, the Channel Islands and Gibraltar. Also overlooking the Gardens is Ten Trinity Square, built in 1912-22 to serve as the headquarters of the Port of London Authority before it moved to Gravesend in 1970 and a reminder that London was the world’s largest port until 1939. 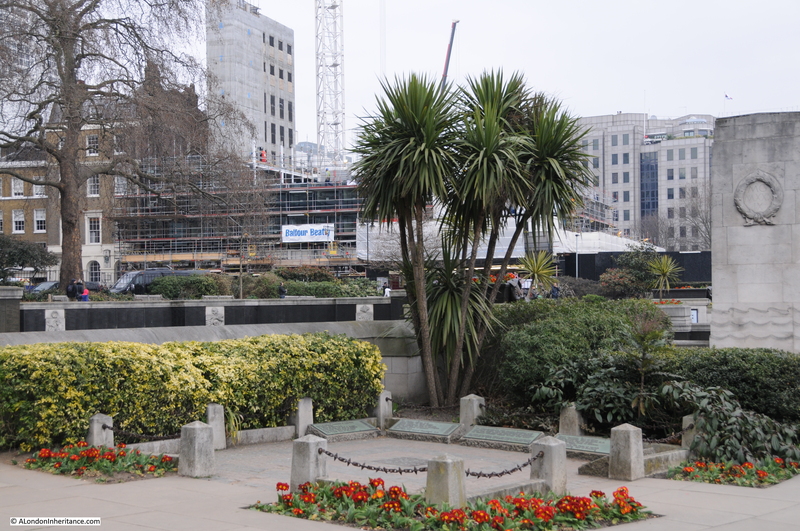 Indeed, the Merchant Navy Memorial was designed originally to be erected at Temple Stairs on the Embankment but the site was deemed unsuitable with Tower Hill then being chosen because of its maritime links. 6. Trinity Square Gardens is managed by Tower Hamlets Council in partnership with the City of London Corporation and supported by the Tower Hill Trust and Heritage Lottery Fund. Finally, congratulations on your site and keep up the good work! Roger, thank you for the feedback and the additional information. Trying to write a post a week often means I cannot get to the level of detail I would like, so I am always grateful for additional information about the locations I cover. Walking around the memorials and seeing the names listed by ship, with entire crews being lost does make one realise the sacrifice made by so many. I did not know that the original location was to have been Temple Stairs. Tower Hill is perhaps a better location, although it is a shame there is the level of traffic alongside the memorial and with the area being used as a cut through, or bypassed between the underground station and the Tower, but that is London! Thanks again. My grandad has his name on one of the plaques. It was a disgrace that the families were charged to attend the opening at the time and most of the families did not attend the grand opening. It was bad enough to loose thier husband and sons and then to be charged a fee to attend the grand opening was a disgrace. Finally, may I hope that Mr Tansley will allow me to ask his grandfather’s name? He will be remembered at the Remembrance Day service at the Merchant Navy Memorial on 11th November.